Mother’s Advocate is delighted to announce this week’s blog post and Facebook contest by Dr. Gerald Newmark and Laurie Haessley. Dr. Newmark’s work regarding the Five Emotional Needs of Children is receiving accolades everywhere – from breastfeeding support groups and new father groups to school systems and corporate America. He reminds families that when we treat one another with respect, acceptance and inclusion the world become a more peaceful and loving place. Laurie Haessley is a WIC Breastfeeding Coordinator in California. Read on to learn more about the connection between exclusive breastfeeding and emotionally happy children and how to enter to win a complimentary copy of Dr. Newmark’s book. Laurie: As the WIC Breastfeeding Coordinator of a very large county in California, Riverside County, I am responsible for developing and managing our breastfeeding education, support and assistance program. The goal of everything we do is to increase the exclusive breastfeeding initiation and duration among mothers enrolled in the WIC program. I am always searching for ways to better serve our WIC families and making ‘course corrections’ in our program so we can best meet the needs of our mothers and babies. For many years WIC Breastfeeding Peer Counselors have facilitated breastfeeding mothers groups where mothers come together to discuss breastfeeding issues. Approximately 6 years ago our Peer Counselors realized that mothers stopped breastfeeding because of life issues NOT because of breastfeeding issues. We determined we needed a social-emotional component for our breastfeeding program. At about the same time I met Dr. Newmark speaking at a conference and decided then that we needed a course correction for our breastfeeding mothers groups. Dr. Newmark: At the conference, I spoke about how babies, toddlers, children, teenagers, parents and grandparents ALL have the same emotional needs. Meeting these needs in childhood provides the foundation for success in life. Being a relaxed, happy person who enjoys life is one of the greatest gifts a parent can give to a child and is one of the most important attributes a parent contributes to a child’s sense of security. This is vital to a child’s sense of security all the time, but especially during the breastfeeding period. Our breastfeeding mothers groups are THE success for the high exclusive breastfeeding rates in Riverside County. The groups are successful because mothers’ emotional needs are met. Most women stop breastfeeding when they perceive life problems as insurmountable which leads to a lack of confidence as a mother. Breastfeeding requires self-confidence and mothers who lack self-confidence are not successful breastfeeding. Our mothers groups facilitated by our awesome peer counselors offer a safe place to discuss and resolve life problems. The groups are a comfortable place to make friends, be with the same moms each month and practice exclusive breastfeeding. Groups are safe places for mothers to open up and share their inner most feelings while respecting each others’ differences. At each mothers group emotional needs are met through the concepts of How to Raise Emotionally Healthy Children. Dr. Newmark: Parenting is not something one learns once and masters for all time. Babies and children of different ages may have the five emotional needs to different degrees. They may need to be satisfied in slightly different ways. Parents must learn to adjust their interactions accordingly. The concepts and techniques taught in the book are easy to learn but the most important thing is that parents must be good learners and their children are their best teachers. Parents must learn to LISTEN to their children to best meet their needs. Laurie: One critical emotional need of children and parents is explored during each mothers’ group meeting. Feeling Respected – What does respect look like to you? How do babies ‘talk’ to us? How can we show respect to our babies? Feeling Important – How can we make our babies and children feel important? Feeling Accepted – How can we make our babies and children feel accepted? Feeling Included – How can we make our babies and children feel included? Feeling Secure – How can we make our babies and children feel secure? At the end of each mothers group session two questions are always asked: ‘What was a challenge for you this month?’ and ‘What makes motherhood good for you this month?’ Mothers are encouraged to go home and practice what they have learned. Each month confidence is gained by women in their new role as ‘mother’ leading to a successful breastfeeding experience. Dr. Newmark: Laurie and the Riverside County WIC Peer to Peer program have been the pioneers in this emotional health movement. It is now incorporated in many WIC Peer to Peer programs throughout California and nationwide. 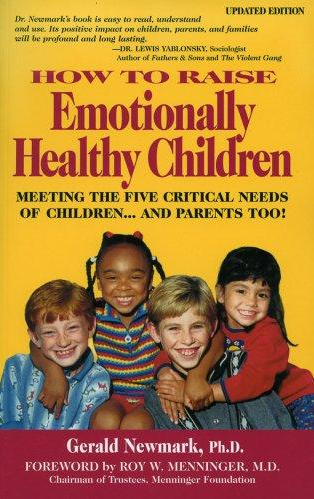 Enter our Facebook giveaway for a chance to win a copy of How to Raise Emotionally Healthy Children: Meeting the Five Critical Emotional Needs of Children.. And Parents Too! log onto www.facebook.com and “Like” our Mother’s Advocate Facebook page! All “Likes” from August 8, 2011 to August 22, 2011 will be entered to win one of 12 copies! Laurie Haessly is the Program Director for Lactation Services or Riverside County and the Operations Director of Best Fed Babies. She has a Master’s degree in Nutrition and is a Registered Dietitian (RD) and an International Board Certified Lactation Consultant (IBCLC). Laurie has been assisting breastfeeding mothers for more than twenty-five years. She has helped thousands of mothers to successfully breastfeed their babies. She sits on both the National WIC Association and California WIC Association Breastfeeding Committees. Laurie developed and oversees the popular Breastfeeding Cafes, Moms2Moms Groups and Sistah Connection Groups based on the Raising Emotionally Healthy Children concepts in Riverside County, California. Laurie has received numerous “best practices” awards for the work she has conducted at the national, state, and local levels. Recognitions have included the Economic Research Service’s “Innovative Breastfeeding Practices” award; the Princeton Mathematica Institute’s “Best Breastfeeding Practices” award; and the Loma Linda University Perinatal Services Network’s “Most Innovative Breastfeeding Promotion” award. The healthy birth practices we support lead to mothers and babies having the safest, healthiest, most satisfying births possible. This advocacy is now more important than ever, as evidence supporting the theory that babies are conscious at birth continues to grow. We are pleased to have Dr. Carrie Contey, a prenatal and perinatal specialist, join us to discuss optimizing your birth environment for the benefit of both you and your baby. Thanks to the pioneers of prenatal and perinatal psychology, we are gaining awareness of how birth profoundly imprints itself on our lifelong health and behavior. In one landmark study, children under hypnosis were able to recall the very minuet details of their birth experiences. These stories were matched to the reports given by their mothers, who were also under hypnosis. Babies are undoubtedly conscious — physically, mentally and emotionally — at birth. This fascinating discovery confirms that facilitating a better birthing experience for all mothers and newborns is absolutely essential. Physically, an emerging newborn is well aware of his or her environment during birth, as most senses have developed weeks prior. During birth, a child is capable of hearing, touching, tasting and smelling everything around him or her. So, how can we care for baby’s senses at birth? Seeing: Because a baby’s eyes are so sensitive and used to seeing light filtered through mother’s belly, the lights should be dimmed. We must allow baby’s eyes to adjust to the outside world slowly and without shock. Hearing: Likewise, a baby is used to hearing sounds that are muffled by flesh and fluid, so speech should be soft and noises should be kept to a minimum. Tasting: If possible, nothing should be placed in the newborn’s mouth before he or she has a chance to breastfeed. Babies are prepared for and expecting to taste their mother’s breast milk soon after birth. Imposing bottles or syringes on them during the perinatal period is invasive and detrimental to bonding. Smelling: Babies are precisely sensitive to smells. The birth environment, especially in a hospital setting, can be overwhelming to the olfactory system. We must be mindful of the potency of all natural and non-natural agents used around baby during birth. Touching: Through touch, we communicate love, fear, tenderness, violence, confidence and ineptitude. Within seconds after birth, mother’s hands should be the hands that welcome her children, and reassure them that they made it, and they are safe and loved. Anyone else who has contact with the baby should use respectful, loving touch when handling the newborn. More and more parents are talking to, playing music for, and bonding with their unborn babies. If babies can learn in utero, one could easily infer that they are also learning during birth. Babies are not only affected by the words said to them during birth, but the emotions surrounding the event, as well. Creating a powerful and positive birth setting is key to bringing baby into this world peacefully. So, how can we foster baby’s mental and emotional health at birth? Through re-birthing and other therapeutic techniques that allow people to re-experience their births, we know that birth is often scary, stressful and painful for the newborn. Addressing the baby and telling him or her what is happening — to both baby and mother — during the birth is key, and especially crucial during any invasive procedures. Verbally reassuring babies that they are safe and supported during their journey can alleviate some of the fear they might experience. Leaving the womb is a profound transition, and can be disorienting and shocking to the system. Once the baby is born, everyone in attendance must be thoughtful of how they place their attention on the baby. The birthing environment should be filled with love, joy and reverence for the newborn child. Upon delivery — and before the child is taken away from the mother for bathing, weighing and other interventions — baby should be placed naked on the mother’s abdomen. In that position, the child can smell her smell, feel her warmth and hear her voice. Once again, they are together, yet seeing each other for the first time. Shortly after birth, the child enters a quiet alert state. During this time, the newborn is very still and often molded to the mother’s abdomen — but able to see, hear and respond to his or her new environment. Both newborn and mom are instinctually prepared for and expecting this time to bond — face-to-face, skin-to-skin and mouth-to-breast — immediately after birth and for the next several months. This initial bonding period is crucial for a mutually healthy and fulfilling birth experience. No longer can society afford to ignore the consciousness of babies at birth, and the detrimental effects caused by many current methods of birthing. It’s important that anyone present at a birth — mothers, birth support persons and care providers — honor and respect the birthing process, and yield to the innate wisdom of the newborn. Carrie Contey, M.Ed., M.A., PhD, received her doctorate from Santa Barbara Graduate Institute in clinical psychology, with a specialty in prenatal and perinatal psychology. She has been passionate about birth, babies and parenthood since she was a child herself, and has dedicated her adult life to pursuing the academic study and hands-on art of early parenthood and optimal human development. Carrie is a nationally-recognized early parenting coach, consultant, speaker and educator. She is also the co-founder of the Slow Family Living Movement, and has served on the board of directors of the Association for Prenatal and Perinatal Psychology and Health (APPPAH). She lives, works and plays in Austin, Texas. To learn more about Carrie Contey, please visit her Web site. We believe that knowledge brings women power in birth — which is why we’re thrilled to feature birth advocate, doula and soon-to-be Lamaze certified childbirth educator Danielle Elwood’s detailed and practical account of the stages of labor. She’ll share what mothers can expect during each stage, and offer helpful hints for mastering each with the Mother’s Advocate community. Through my work as a doula, I’ve noticed that most pregnant women don’t fully understand the different stages of labor. It’s hard to find this information in most studies, even — so childbirth education classes are really the only way to become acquainted and comfortable with what your body goes through in labor, and learn how to cope. Since it’s essential to be educated and confident going into birth, I’ve decided to share some necessary knowledge about the stages of labor. During prodomal labor, the cervix begins to thin out, soften and move forward. The cervix may also start to open. Your baby will settle into your pelvis. You may start to notice some contractions, but they will remain irregular, slightly noticeable, and will not form a pattern. These contractions may even be identified as a pain in the lower stomach or back. Prodomal labor can last anywhere from a few hours to days. This is your body’s way to gear up for the marathon of labor it will be running shortly. Don’t worry about or over-think this stage of labor. You will not miss labor, and will certainly know when you are in full labor! Be patient! Have confidence that your body truly knows what to do. Take care of yourself. Sleep, eat and stay active. Be sure to surround yourself with supportive and positive people. You’ll want those around who make you feel not only safe, but also comfortable. In early labor, the cervix will begin to dilate, continue to thin, and will likely reach three to four centimeters. This stage of labor can be slow, but most prefer to call it gradual. On average, the latent phase of labor makes up two-thirds of the total labor time. Over time, your contractions will become longer, stronger and more intense. They will also become more regular, and start to form a pattern — usually five minutes apart, and 25 to 45 seconds in length. You may have pinkish discharge that is normally called “show.” This will increase as labor progresses further. Be calm, relax, and don’t get too excited or worked up that labor has finally started. Alternate staying active with relaxation. A great example is doing chores or taking walk, followed by taking a shower. Also include snacks and lots of fluids in your routine. Keep your environment pleasant and positive. Visitors or people who will not carry out this kind of environment should be asked to leave or change their tune. Work on positive activities — do some light work in the new baby’s room, listen to music, or even watch a favorite TV show. Stay at home as long as you can. Most women find that home is the most comfortable option for laboring in a positive environment. When contractions start to become more intense or unbearable, be sure to have your support team there to help you. Use relaxation, as well as breathing, to work through your contractions. In active labor, your contractions will become longer and stronger, and should be about three minutes apart, lasting for about one minute each. During this phase, which lasts between two to six hours on average, the cervix will completely efface and dilate to eight centimeters. Women in active labor will start to become very focused on their labor. Listen to your body! It is meant to give birth to babies, and now has you really rockin’ and rollin’ toward your ultimate goal. Stay active during contractions — walk, talk, breathe, or just move around, and take the time in between contractions to rest. Create a peaceful and relaxed environment, as your surroundings will inevitably impact your labor. Personalize your birth environment. Use your own music, clothes, and comforts of home (especially in a hospital setting). Changing positions will help you stay more active and comfortable, and will also help you progress. During the transition period, the cervix will finish effacing and dilating. Your contractions will be powerful, efficient and close together. Some women will feel very sick to their stomach, or actually vomit during transition. Women may also feel reckless or increasingly emotional and irritable. This phase usually lasts less than an hour. Focus on your contractions, one at a time, to prevent yourself from becoming overwhelmed. Continue to focus on your breathing, as well as any visualization techniques. Those who are providing labor support should be giving you their undivided attention to help you through contractions. Massage, talking you through each contraction, encouragement and praise are helpful. Continue to use the time between contractions to rest and relax. During the second stage of labor, your body will shift from dilating and effacing to pushing. Your baby will make its way down through the pelvis and birth canal. Some women may not feel the urge to push right away after full dilation, but many will feel the urge to start to “bear down” quickly. This urge will continue to get stronger as the baby descends. Many women will feel as though their mind has been “cleared,” resulting renewed energy for pushing. And, just before the baby is born, many women will feel a burning, stinging and stretching sensation at the vaginal opening. Many call this the famous “ring of fire,” but not all experience it. Your baby’s head will emerge, and baby will turn to one side to allow the shoulders to pass through, then the rest of baby will slip right out. The pushing phase can last anywhere from 15 minutes to hours. Follow your instincts. Women normally feel the strongest urge to push at the peak of a contraction — so follow your body’s direction. It may help some women to be vocal, but loud, high-pitched sounds will only use up all of your energy and breath. Low, deep noises and moans are most helpful. Those supporting you in your labor should remain as quiet as possible, or provide gentle support and encouragement. Let go of any tension you may feel in your perineum. Applying a warm compress may help. During the recovery phase, your baby should be placed on your abdomen, and quickly dried. You will probably experience a boatload of feelings — excitement, joy, happiness, awe, and relief that it is finally over! The umbilical cord will be cut, and the placenta will usually be delivered within 30 minutes. Many women get after-pains, or “the shakes” after birth. Cold compresses are often applied to the perineum to ease discomfort, as well as help with the swelling. All routine infant procedures can be done without removing your baby from your side. Request that all measuring, weighing, and other procedures be delayed for the first few hours. Offering your baby the breast during this time will increase the likelihood of a successful breastfeeding relationship, and will also help decrease the bleeding and tightening of the uterus. Touch, caress, and cuddle your new baby without time restrictions. Uninterrupted, skin-to-skin contact with your baby is best for bonding. Welcome to motherhood! Danielle Elwood’s birth advocacy began in 2007, with the cesarean birth of her first child that very well could have been prevented. Because of her experience, she became heavily involved with The International Cesarean Awareness Network (ICAN), and began writing in hopes of educating other women in her position. She started her work in the childbirth community as a postpartum doula, and is currently working on her certification to become a Lamaze Certified Childbirth Educator. Danielle is a dedicated mother of two small boys, Camden and Benjamin, with her third baby on the way, and the wife of a veteran marine and fire fighter. For more, visit her blog, Momotics.com. This week, we want to hear from you! What impact did holding baby skin-to-skin right after birth have on your birth experience? To share your thoughts and experiences, simply write in the comment field below. 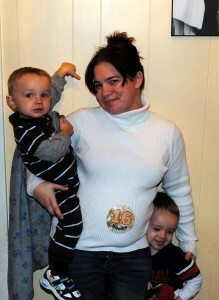 And … stay tuned next Monday (February 14th) for Danielle Elwood’s blog on the stages of labor. She’ll cover what’s going on in each stage, and what can help you cope! Standing up for the birth you want is a feat on its own (be proud! ), but is really only the beginning of defending and implementing what’s best for you and your baby. This week, Amy Romano, birth advocate and midwife, shares her journey to finding the confidence to nurse in public. You’ve just accomplished the most miraculous feat: You’ve given birth. You fought for the birth you wanted — the birth that was best for you and your baby. Wise mothers will tell you that fighting for your birth is the first frontier. What’s next? The first moments after birth are essential — they’re when a mother and her baby bond, skin-to-skin, and begin the journey to nourishment: breastfeeding. Breastfeeding is such a personal act, an intimate dance between baby and mother (much like giving birth). Slowly (sometimes excruciatingly slowly), mother and baby find a rhythm, and open up little by little to the outside world. Rituals and routines established in the early days — I sit on this area of the couch with these pillows, looking for the feeding cues, and finally get the latch just right — give way to a looser, more organic relationship. The first time I nursed in public, I was at a La Leche League meeting. What a perfect way to be initiated to nursing around other people. Then, when my baby was just 2 months old, I went to my first Lamaze conference. I nursed in educational sessions, the exhibit hall, and around the hotel during breaks. I shared a hotel room with women who were well past their childbearing years, and yet welcomed having a baby at the slumber party (and no, my baby most definitely didn’t partake in the “slumber” part). Then, I had to report briefly to the board of directors about a project I was working on, and I breastfed my baby at the boardroom table while I presented to the board members. I look back on this time now and I realize how fortunate I was. My earliest experiences of opening my baby’s and my universe to others reinforced that nursing is normal, joyful and important. In a way, it was totally unremarkable to nurse my baby while addressing my supervisor and her board of directors. But at the same time, it was something to be celebrated. The people at the table weren’t weirded out that I was breastfeeding. They loved it — reveled in it. We even took the time to talk about how important it is to have babies at our conferences — after all, our work affects them! My son weaned 4 months ago, ending what had been more than 6 years of continuous pregnancy or nursing. I have nursed in more places than I could ever begin to count. Wherever I’ve been when my babies happened to become hungry, I’ve nursed. And only once — ever — did I overhear a negative remark. I was sitting in a coffee shop nursing my then 18-month-old son, and a 20-something-year-old guy behind me said to his friend, “You know what I hate? Babies who breastfeed.” I saw his comment for what it was — ignorance mixed with an “I’m-an-‘ironic’-hipster-trying-to-impress-my-friend” demeanor. It didn’t bother me personally (at all! ), but I can only imagine a new mom (who hasn’t yet gained confidence in her breastfeeding) hearing that and feeling like an outcast. When I look back on that moment, I mostly just feel sad for him — and others like him — who fear breastfeeding, who fear birth, who fear these things that are completely normal, natural and beautiful. And it makes me all the more thankful for all of the advocates out there who provide irreplaceable support. On that note, I’d like to thank the wonderful folks at La Leche League for instilling in me the early confidence to breastfeed in public. I’d like to thank all of the Lamaze leaders with whom I was so incredibly fortunate to share my early mothering. And lastly, I’d like to thank the birth advocates. What an amazing network of remarkable people, standing up for such an amazing cause — what a gift. 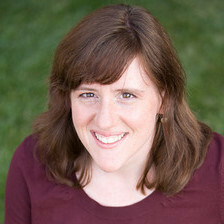 Amy Romano is a midwife and expert in evidence-based maternity care. She manages Lamaze International’s award-winning research blog, Science & Sensibility. A frequent contributor to online and print journals, Amy believes that with a better understanding of the research and scientific evidence, we can improve the health and care of women and infants in pregnancy, birth and beyond. Follow her on Twitter at @midwifeamy.